So, in this post, I’ll consider what is the meaning of life and the meaning of the universe in order to locate the key and apply it to our daily life. First, let’s consider the revelation of the Bible and then how to practically apply it. The key to our meaning and the meaning of the universe is a matter of two spirits—God’s Spirit and man’s spirit. The key to this meaning lies in God being the Spirit and also in our having a spirit. Without God being the Spirit and without man having a spirit the universe is empty and we become nothing (Zech. 12:1). When we’re ignorant of God, the universe seems to be full of emptiness. And when we’re ignorant of our spirit, our life seems meaningless. However, deep within, we can’t be satisfied with an empty and meaningless existence. God is Spirit for man to contact Him, receive Him and enjoy Him. The good news is that the Bible reveals a definite meaning. First it unveils the unique God. The first verse of the Bible begins, “In the beginning God created…and the Spirit of God was brooding” (Gen. 1:1, 2b). The Scriptures firstly reveal God who is Spirit. This revelation of the Spirit of God is progressive from the beginning to the end of the Bible. God passed through a long process, including the steps of Christ’s incarnation, death and resurrection, to ultimately reach us as “the Spirit,” the life-giving Spirit, the Spirit of Jesus Christ (John 7:39; 1 Cor. 15:45; Phil. 1:19). In my last post “Enjoying Constant Salvation by the Bountiful Supply of the Spirit of Jesus Christ,” I presented this Spirit, with all His riches for us to apply. As such a Spirit, God is now available for us to contact, receive, and enjoy. In fact, in the Gospel of John you can see that the real worship to God is to drink Him as the Spirit, as the rivers of living waters (John 4:24, 14; 7:37-39). Man has a spirit to contact God, receive God, and worship God. The story of the spirit of man is also very wonderful. First, God created us as a tripartite vessel, with a spirit, soul, and body. He formed man of the dust of the ground (his body), “breathed into his nostrils the breath of life” (his human spirit) and man became a “living soul” (Gen. 2:7). The apostle Paul confirmed this point when he said, “the God of peace Himself sanctify you wholly and may your spirit, and soul, and body be preserved complete” (1 Thes. 5:23). So from these two Bible verses it’s clear that man is of three parts and that man’s spirit is distinct from his soul. In fact, the Scripture says that God’s living word is able divide man’s soul from his spirit indicating a definite distinction (Heb. 4:12). Yet, due to man’s fall (Gen. 3), the spirit in man became deadened (Eph. 2:1). However, this was not the end of the story. Christ became a man, died for our sins, and rose from the dead, becoming the life-giving Spirit to enliven our deadened spirit (1 Cor. 15:45; Rom. 8:10). Now, whenever anyone believes in such a Christ with His redeeming death and life-imparting resurrection, God automatically justifies him, and enlivens his spirit (v.10). The Bible speaks of this enlivening of our spirit as regeneration or being born anew, born of the Spirit (1 Pet. 1:3, 23; John 3:6-7). The issue of this divine birth is that the Holy Spirit comes to dwell in our spirit (Rom. 8:16), so that we can enjoy the Lord and His grace with our spirit (2 Tim. 4:22; Gal. 6:18). By these two spirits God and man have an organic union and become one. The story of these two spirits consummates in the Spirit and our spirit coming into an organic union and becoming one mingled spirit (1 Cor 6:17). 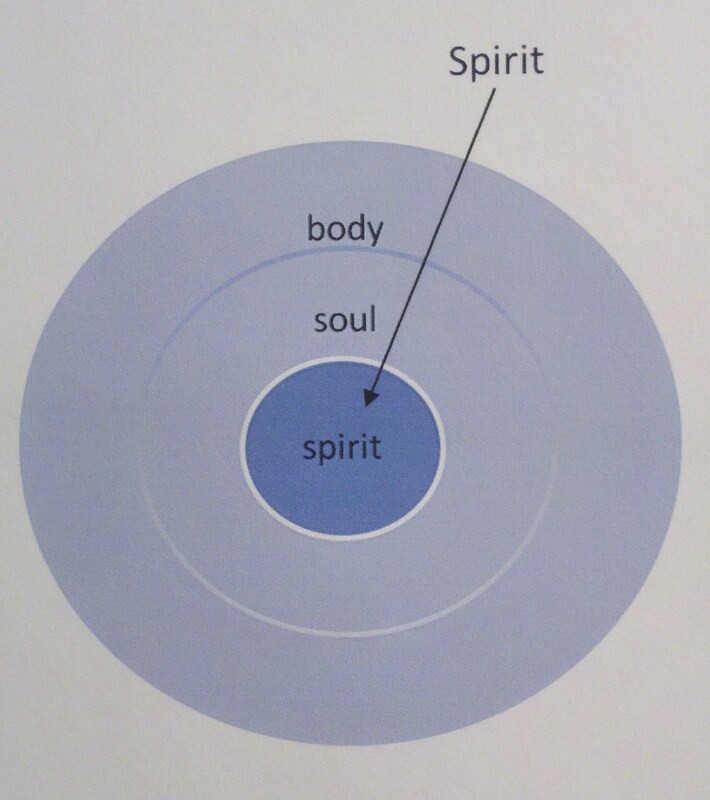 Our spirit is the destination of the journeying Triune God. It is in this union of the Spirit with our spirit that we find the meaning of life and of the universe. Here we can live a meaningful human life, a normal Christian life, and walk according to this spirit to fulfill God’s purpose. Now we need to learn to exercise our spirit to contact God and be one with God in our daily life. Thankfully, such a revelation is not just a scenic view for us to appreciate, but a key for our daily practice. To apply this key we need to exercise ourselves unto godliness by daily fanning our spirit into flame, setting our mind on the spirit, and discerning our spirit from our soul. We need to listen to Paul’s charge to his young co-worker Timothy. He said, “Exercise yourself unto godliness” (1 Tim. 4:7). “To exercise yourself unto godliness” is to exercise your spirit in contrast to the exercise of your body (v. 8). Your body definitely needs a certain amount of proper exercise to be healthy. But even more, your spirit needs daily, hourly, and even moment by moment exercise. You can do this by calling on the Lord (1 Cor. 12:3), praying short prayers (Eph. 6:18), singing spiritual songs (Eph. 5:18-19), and speaking out your enjoyment of Christ (2 Cor. 4:13). To exercise your spirit requires that you fan your spirit into flame (2 Tim. 1:6-7). We shouldn’t let our spirit lay dormant. It may not be easy at first. Most exercise requires some stretching to make a gain. So we need to make it a daily habit to exercise our spirit. Paul said, “always rejoice, unceasingly pray, in everything give thanks; for this is the will of God in Christ Jesus for you (1 Thes. 5:16-18). Any time is good, but it really helps to set aside a more definite time for this kind of stronger exercise. The Bible is very consistent in stressing the early morning as the best time to exercise yourself unto godliness (Psa. 119:147; Prov. 4:18). Try setting aside at least 10-15 minutes of spirit exercise to begin your day. Exercise your spirit to call on His name and speak to Him. Then enjoy a couple of Bible verses by means of all kinds of prayer in your spirit (Eph. 6:17-18). Then, as you continue your day, practice to set your mind on the spirit (Rom. 8:6). After fanning your spirit into flame, in the morning, don’t let it wander in an unregulated way. Use the verses you enjoyed in the morning to set your mind on the spirit throughout the day. Finally, learn to discern your spirit from your soul in whatever your doing (Heb. 4:12). If it doesn’t originate from this mingled spirit, you don’t want to say it or do it. Having the living word of God operating in you during the day will really help you to discern your spirit from your soul. This post was inspired by The Holy Word for Morning Revival on The Crucial Elements of the Bible, especially Week 4 Outline and Day 6. I would also recommend The Spirit with Our Spirit, chapters 6 & 8, by Witness Lee. You can read it at ministrybooks.org. ←What is the kingdom of God? Everyone need the Lord Jesus Christ! May you have His mercy and love! I thank God almighty for His grace upon you Brother Tom Smith. I am graciously blessed by you ministration, writings.